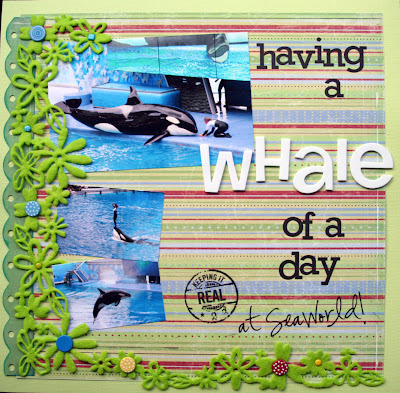 Whale of a Day uses yummy Crate Paper Brunch collection (Love these papers! ), Queen & Co felt ribbon, various brads and American Crafts foam Thickers. The rest of the title and the little stamp (by Katie Pertiet) were printed straight onto the paper again. Definately a couple of new favourites there! 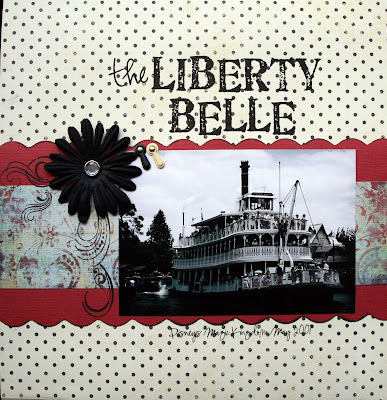 Its great being able to print titles and journalling straight onto the cardstock or patterned paper. I used 7 Gypsies paper, some MM Clears flowers, and Technique Tuesday stamps. 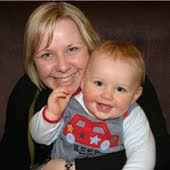 Well, I didn't realise it had been quite so long since I last blogged! Oops! Still, at least it means I have a couple of things to share. Well, 3 actually! The first one is pics of my good friend Winnie the Pooh at the Magic Kingdom -I am a Bear of Very Little Brain, and Long Words Bother me! Love Pooh quotes! I have used some Sassafrass Lass paper, Chip Chatter letters that I inked and UTEE'd to make the right colour, MM flower grommets, and the scalloped frame was cut on the Craft Robo, inked and UTEE'd to match the letters. 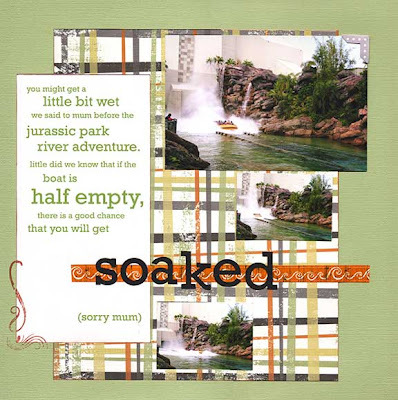 Next up is "Soaked" - journalling tells the story of the day we took Mum on a water ride at Islands of Adventure after assuring her that she wouldn't get wet (well, we normally don't! ), but sadly, the boat was half empty and Mum seemed to come off wetter than the rest of us! I think she might forgive me one day! I have used some Junkitz papers, Heidi Swapp tape, Technique Tuesday stamp, and the title was cut on the Robo. And here we have a LO featuring me, and my chickens classic line....journalling as follows... "Picture the scene. It's the last day of our Florida holiday, and me, Ste, Mum and Dad are in the car, on our way to the airport to catch our flight home. Ste and I had been up till about 3am, enjoying ourselves in the hotel bar. I was feeling rather tired and maybe a teensy bit narky at this point, and frankly, the last thing I wanted to do was go and sit on a plane for 8 hours. "Are you feeling OK?" someone asked me. "You seem very quiet." Quick as a flash, Ste turned to them. "What have I told you?" he said. "DON'T POKE THE BEAR!"" Cheeky boy, I don't know what he was trying to say. 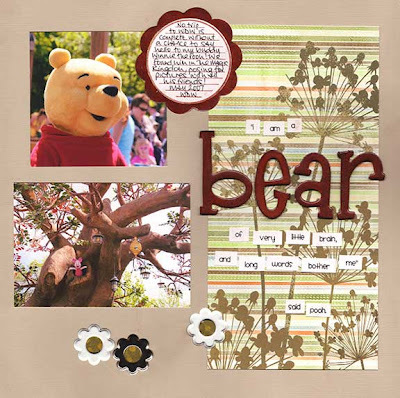 I used Crate Paper Cowboy, some BG chipboard brackets inked and UTEE'd (thanks Vic! 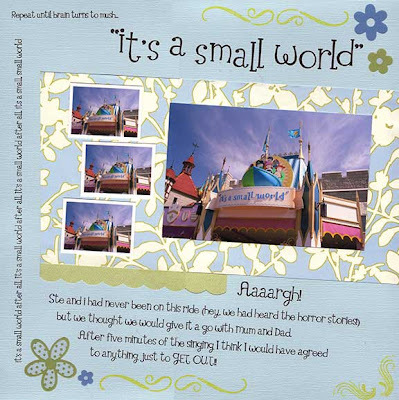 ), various buttons, and the journalling and title was printed straight on to the patterned paper from the computer. Thats about it for now!